on ARC fitted dive masks. vision. SEAVUE 2 fl. oz. Mask Scrub with Natural Flaxseed Meal™ will gently create a glass surface that will give you the best vision possible. How SEASOFT’s SEAVUE 2 fl. oz. Mask Scrub™ works! 1. “Calcium Carbonate” a mild abrasive is made from ground up oyster shells. It has a relatively low hardness level of 3 on Mohs scale of mineral hardness. Calcium Carbonate will not scratch glass, harder plastics and most metals. 2. “Natural Flaxseed Meal” is comprised of ground flax seeds that are naturally high in soluble fiber. A naturally soft abrasive, it helps to mitigate and compliment the calcium carbonate. The FLAXSEED Meal acts like millions of miniature sponges with the abrasiveness of the calcium carbonate. Together, they form a powerful union of abrasives to ensure that your dive mask is free of all of the compounds and residues that can compromise your underwater vision. How to use SEASOFT’s SEAVUE 2 fl. oz. Mask Scrub™! For non – ARC dive masks: Apply a quarter size amount of SEAVUE 2 fl. oz. Mask Scrub™ on the inside of each side of your dive mask and now take your index finger and massage the abrasive firmly against the glass in a circular motion working toward the outside of the lens. You should spend approximately 15-20 seconds per side cleaning the glass. NOW put the mask under warm water and thoroughly rinse the mask until all traces of the SEAVUE Mask Scrub™ have been washed away. Use a micro-fine towel to dry your mask and then allow it to air dry. 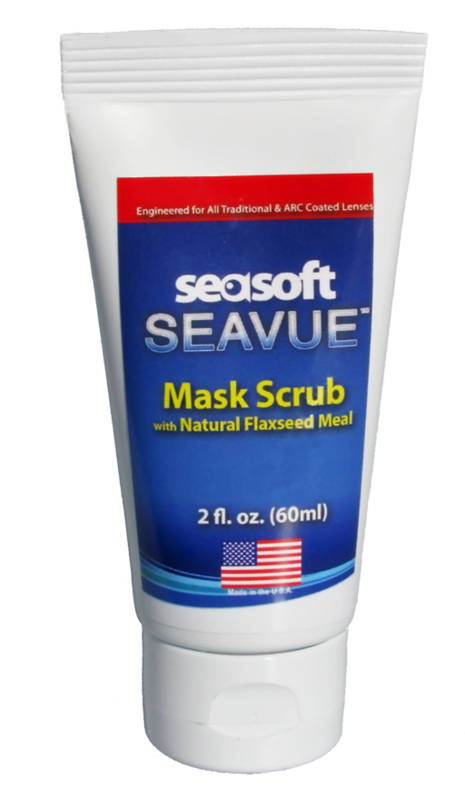 Now check your mask to be sure that ALL of the SEAVUE Mask Scrub™ has been removed. Use SEASOFT’s SEAVUE 2 fl. oz. Anti-fog Spray before using in the water. For Masks with ARC lenses: Apply a small amount of SEAVUE 2 fl. oz. Mask Scrub™ to the far corner of the mask lens and gently rub it into the glass in a circular motion. SEASOFT has tested SEAVUE 2 fl. oz. Mask Scrub™ on the most popular brands of dive masks to insure efficacy but you will want to double check your mask first. After testing and rinsing the test area and finding no noticeable effects you can now apply a quarter size amount of SEAVUE 2 fl. oz. Mask Scrub™ on the inside of each side of your dive mask and now take your index finger and gently massage the abrasive firmly against the glass in a circular motion working toward the outside of the lens. You should spend approximately 15-20 seconds per side cleaning the glass. NOW put the mask under warm water and thoroughly rinse the mask until all traces of the SEAVUE 2 fl. oz. Mask Scrub™ have been washed away. Use a micro-fine towel to dry your mask and then allow it to air dry. Now check your mask to be sure that ALL of the mask scrub has been removed. Use SEASOFT’s SEAVUE Anti-fog Spray before using in the water. IMPORTANT: SEASOFT SCUBA and/or any of its resellers will not be responsible for damaged or marred lenses. You must: 1. First test a small corner of the lens. 2. Rub gently.